The 2016 FIM MXGP Motocross World Championship may have ended for Team Suzuki but racing continued this weekend with three of the factory crew in action at the Motocross of Nations and Kevin Strijbos rode superbly to finish third overall in the MXGP category and assist Team Belgium to fourth place; just missing the podium by three points. Maggiora Park – stage of the Grand Prix of Italy for the last three years – unveiled an altered layout and expanded infrastructure to cope with the 85,000 crowd and large industry presence attracted to the biggest off-road motorcycle race of the year. The Italian hard-pack was both fast, rough and bumpy in sections and characterised by some of the vast hill climbs and drops that make Maggiora so distinctive. Three riders per team (in MXGP, MX2 and MX Open categories) and three races in one day; the Motocross of Nations is the ‘World Cup’ of the sport and 38 countries pitched-up in the paddock at Maggiora to do battle. Each nation counted their five best results from the six accrued across the board and with the lowest score forming the final classification. With points awarded in accordance with position Strijbos went 3-3 with gusto. The 31-year-old enjoyed a decent run in the Qualification race on Saturday to take third place in the MXGP class. 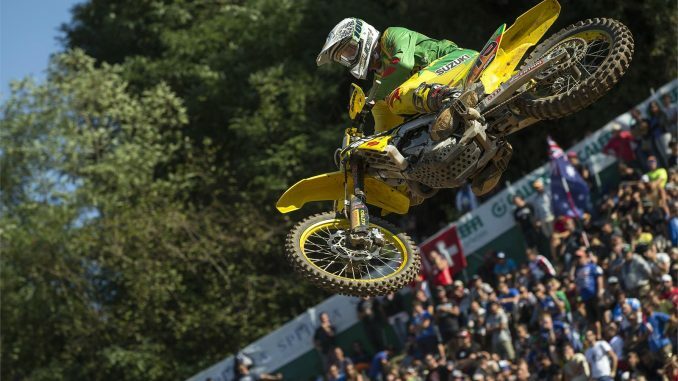 Strijbos celebrated a moto victory at Maggiora in the wet 2015 Grand Prix and brought positive previous form to the meeting. In the first race he was again excellent and surged from ninth place to pass former team-mate Glenn Coldenhoff and score third. In the third moto (MXGP grouped together with MX Open) ‘#22’ started in seventh and again attacked and gained ground to enter the top three. Jeremy Seewer starred in MX2 and with his RM-Z250 for Switzerland. The 2016 Championship runner-up was always facing an uphill task against the bigger 450s and his 11-8 scorecard meant he was the third-best MX2 athlete in the ranking. The Swiss trio struggled slightly with Valentin Guillod riding injured and a potential podium slipped away to what would be a sixth position overall.